Designs by Lisa Somerville: Color Collage - Where's Waldo? Color Collage - Where's Waldo? My current favorite technique has got to be the Color Collage from the April TJNL - what a great way to add a lot of color and images to one project. 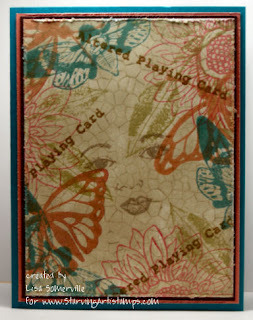 For this card I used all Ranger Distress Inks (Old Paper, Frayed Burlap, Brushed Corduroy, Shabby Shutters, Dried Marigold, Broken China and Worn Lipstick). Because the Distress Inks stay wet longer, I used white card stock to stamp my images. All stamps are from Starving Artistamps - don't forget you can save 10% on all orders from Starving Artistamps - just enter code Lisadis when you check out. Have you entered for your chance to win the new Doodle Factory Set? Click here to enter. Gorgeous! I love the new look of your blog! FAB! Coloars and images are just wonderful! I love new look to your blog. Looks great! !